I live in a household of Star Wars fanatics. I grew up a Trekkie, but am a Star Wars person by marriage and my kids insist that no other space story could ever be better than Star Wars. My husband reads the books, refers to the "canon" and eye rolls at the movies that mess up the story. Over the years, I have gifted him many Star Wars things, and I've even made a few (well, more than just a few, I realized after typing this out!) For example, I bought Star Wars fabric and made him a couple pillow cases. This is the method I use for pillow cases. And, I made some ornaments out of the ships on a certain fabric. Maybe when I dig the Christmas stuff out, I'll write a tutorial on that! I've even made my husband and son Obi Wan and Yoda costumes for Halloween! I used this pattern. I made Layla a Rey costume too and my son a Kylo Ren cloak, but today is one of those days when I just can't wade through photos to find all these old pictures, ha! Sorry. 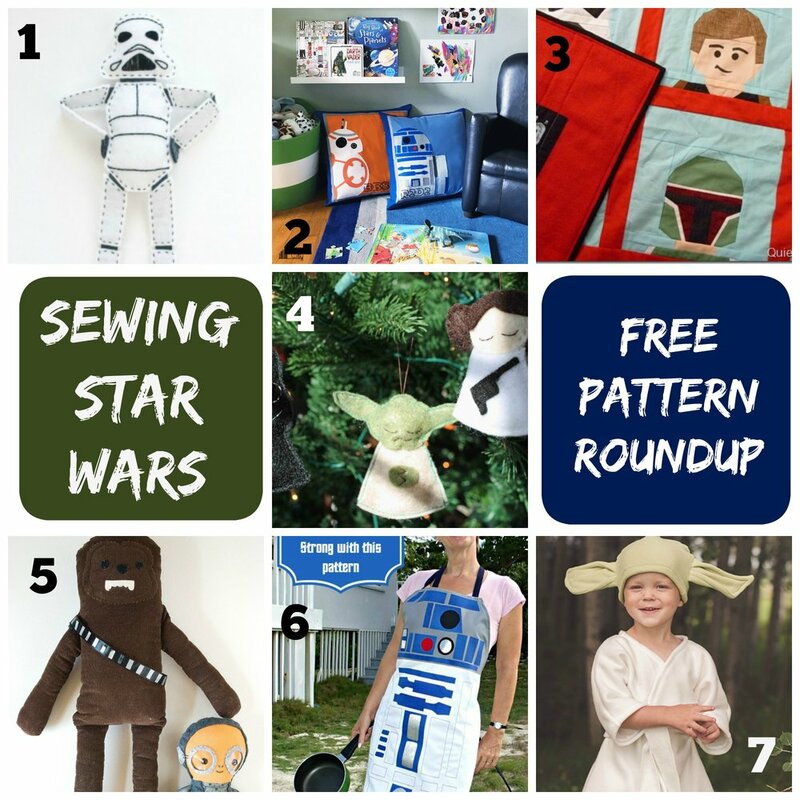 But there are so many good ideas out there for sewing Star Wars that I just had to write a post and link you to the best ones! These are all FREE and include tutorials and/or patterns. See below that photo collage for the links! Storm Trooper doll on crafting-news.com. Ridiculously cute. Bugaboo Studio's DIY Star Wars pillows. Quiet Play's Star Wars quilt is so amazing. She has lots of free paper piecing patterns for Star Wars on Craftsy. I'm currently working on the At-At! So much fun, I can't wait to show you. Free patterns for felt Star Wars ornaments on diygeekery. Oh my goodness, Wild Olive's Chewbaca and Maz Kanata plushies are too cute. Pattern for a fleece Yoda costume on fleecefun.com. Those are the best free Star Wars sewing patterns I've found on the web so far. Have I missed any?? Feel free to link us in the comments! Recently I checked out this book from the library and we all got a huge kick out of it. Especially the Jabba the Hut body pillow, soooooo funny. I actually made that crochet R2 hat for my nephew last year! 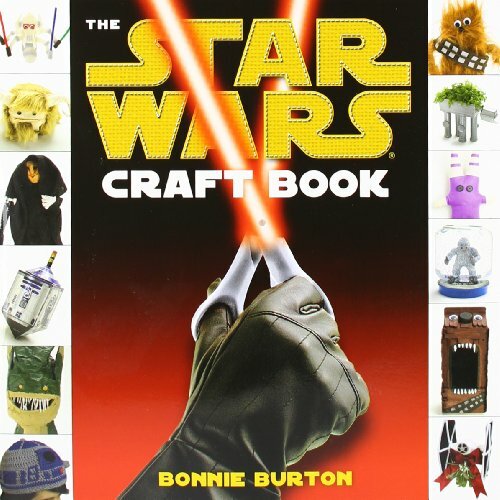 Have you sewn anything Star Wars related? I want to hear about it! I finished a great month of sewing classes today. This month's theme was softies! Our first week's projects was these awesome pig neck pillows. I saw this idea on Pinterest, but it didn't link to a tutorial or anything related to the neck pillow, actually, so I drew the pieces myself and thought I'd share them here for you. Go over to The Crafter Gemini Creates and snag her fab neck pillow pattern and watch the tutorial if you need to. I tried several kids neck pillow patterns and this one is the best! Once you have the pattern, cut it out of your pink prints. Print my free pig part template below (just right click and save, then you can print) and cut those out of the right colors of fleece (or felt works too, but is not as soft on the neck as fleece). Stitch the face pieces in place on one neck pillow piece. Assemble the ears and baste those onto the top where you want them (facing down so that they'll poke up when you turn it right side out. Stitch the front and back together, right sides together, leaving an opening for turning. Clip inner curves to stitching. Turn, stuff and hand sew your opening closed. My students really enjoyed making these pillows! I think they would make great gifts and you could really get creative with different animals or funny monsters. I hope you can make use of this idea! If you do, I'd love to see it, especially if you make some with the kiddos in your life. It's been about a month since I had an emoji pillow sewing class for kids and my own emoji pillow is sitting on my bed, making me laugh on a daily basis, so I thought it would be a shame not to share the templates I made for the class so you can make your own! I'm pretty sure this is what expression is in my mind, if not on my face, most of the time these days. This is not an official tutorial, but I'll give you the basics. I made a circular pattern that was 15" in diameter, using the old string taped to a pencil method. Then, we cut and arranged all our pieces and appliqued them on with a zig-zag stitch. We didn't use any fusible web or anything, but a regular old glue stick can help the pieces stay in place a little better than pins can. I use this trick a lot in my kids' classes! Here are the templates we drew! With any luck, you should be able to right click, save and print. They're not perfectly drawn, hence the free price tag, ha! Of course there are many more emojis you could make! We freehanded several other pieces, but these are the most common. I didn't manage to take many photos during this class (things get crazy!) but here are a few pics of my students working on their pillows. Kelby got in on the fun this class. It's my "policy" to always allow my own kids to sew with my classes if they want to, even if I'm totally full. Natalie joins us almost every time, Layla about half and Kelby a little less than her. He got really excited about these pillows and even made a few more after the class was over. We had enough time to make some mini versions too. Kids gets so creative, I just love it. The mini versions would make great ornaments that kids could give as Christmas gifts if they wanted to, just add a ribbon to hang! If you use my templates, I'd love to hear about it! Sewing camps are over! I'm sad! And tired! Haha. I taught 28 kids to sew this Summer. And the best part is, many of their moms tag me or share with me pictures of them sewing at home on their own. That's the goal, after all! I had a fun group for my last camp and I'm about to unload all those photos on you here, BUT FIRST, I cannot wait to share with you the promotional video my talented friend Liz MacMurray made. I've watched it so many times, it just makes me so happy. If you are local and want something unique for your family photos this year, check out her site and just FYI, she's running special mini-sessions right now!! Both July camps were themed around sewing for 18" dolls and they were so much fun. We made a lot of things and the girls had a blast! This past week they ended each day just trying the clothes on their dolls and making up silly fashion shows. On the last day of camp, we made flip flops and visor out of craft foam, then we have a runway fashion show and then we have pizza and watch an American Girl movie (last week's vote was Lea, but this week they voted Isabell). But this time around, almost everyone just wanted to keep sewing during the movie! They made all kinds of doll tote bags, pillows and other little things, a few even designed little pet beds for their dolls' pets and Natalie made a doll-sized drawstring backpack. They turned the t-shirt pattern around to make jackets, made matching p.j./sleep mask/pillow sets and just got so creative! And now I'm going to take a nap. Natalie is a dancer. She takes ballet, jazz and acrobatics at a local studio (amaaaaazing studio, I might add) and while they wear uniforms for class, they are allowed to get creative with their buns and bun accessories. Recently one of her friends there gave each of her classmates some cute bun nets that match their leotards. When Natalie's came apart, though, I grabbed a crochet hook and fixed it, which made me realize it would be totally easy to make more. So, I looked up some patterns and made one up. Then I decided it would be relatively easy for Natalie to make them herself. I'll be honest, the night she really wanted to learn, while Layla was in her ballet class, I did not feel like teaching her. I selfishly wanted to sit and read a book or chat with my friend. But, I taught her anyway (moral of the story at the end of this post!) and she took to it so quickly! By now, she's memorized the pattern and has gotten really creative with stripes, beads and funky yarns and has taken requests from other dancers in her class! The pattern we landed on is this one. I tried a few others that did not make sense or did not work out, but this one is stellar and easy. We really want to make fun holiday ones especially these pumpkin ones! And these Minnie Mouse ones are sooooo cute!!! I'll admit, when I first became a dance mom, I was truly terrible at the bun thing. Doing hair has never been my speciality and I've never really had a lot of patience to try intricate hairstyles on my girls. But, I must say, I have improved immensely and can now do some pretty cool things on dance days, partly thanks to Natalie subtly hinting that I should watch a few tutorials on Cute Girls Hairstyles. We tried this one today and it actually was easy. looked super cute and kept her bangs held back during ballet. We turned it into a bun, but it will be perfect for ballet and acro days when she needs to switch from bun to pony and still keep her bangs back! So, the moral of my initial story: I didn't want to teach Natalie to crochet that night. I was tired, I was coming off a full week of sewing camp and for some reason felt I deserved not to be required to give and serve any more that day. But, I was reminded that God requires me to pour out in faithfulness, even when I think my jug is empty. Just pour, keep serving, and as you pour, He will provide the energy, the joy, the substance, whatever you need, as He provided the wine for the wedding at Cana. (This analogy is one that was written about on the Femina Girls blog several years ago. I can't find the post now, but I have thought of the lesson often).